It's a double post day today! We're fans of Brewtoad, a recipe creation and sharing site we've been using for most of our brewing adventures. Out of curiosity of what our fellow homebrewers have been up to, we put together a visualization of a sample of recipes created on the site. The main question we're looking into in these charts is how closely brewers adhere to the BJCP style guidelines. The homebrewer questing for that bigger, more hoppy ale is a well-known trope. Does it hold up? Yes. In fact the recipes we looked at included IPAs as high as 700+ IBUs, well above the taste saturation point at 100 to 120 IBU. You'll see these capped at 120 IBU. Color and ABV similarly skew dark and high, with color capped on the charts like IBU. But there are some types which more people are brewing to style. The top chart on our last tab shows % in style, but the bottom chart is more telling since it's not skewed by the tight guidelines put forth for lagers e.g. Oktoberfests. Overall it seems to be beers that are typically among the first beers for new brewers that are brewed with less regard to style, such as stouts, browns and porters. If we hadn't capped IBUs you would also see IPAs up there as well. The beers brewed more closely to style include Flanders Reds, Belgian Blonds and Belgian Tripels as probably somewhat more experienced homebrewers challenge themselves to hit style points. Let us know if you see anything in these that we missed! As promised, we've got some more updates for you about our 50th anniversary barleywine, and some awesome plots of nifty beer statistics. For our 50th batch of homebrew, we wanted to go all out. It would have to be a colossal beer, with bold flavors, and of course a bad beer-jargon pun for a name (as is tradition). Naturally, we settled on a barleywine so massive we needed to build new brewing gear to accommodate it. We would call it "Saccharomighty," and it would be a tribute to the many trillions of Saccharomyces cerevisiae (common name brewer's yeast--see what we did there?) who lived and died to serve the noble purpose of making delicious intoxicating malt beverages. In order to achieve the desired sugar content in the wort (later to transform into an ABV north of 12% in the finished beer), we needed to combine 24lbs of grain with 11 gallons of water--not possible in our usual one-step process in a 10 gallon kettle. Using a simple filter tube ($10 online), an Igloo cooler ($40), and a weldless valve ($20), we put together a simple but effective mash tun, from which we could fill the kettle. The huge grainbill alone nearly fills a 7.5 gallon kettle, and consists of pale ale malt, Vienna malt, Victory malt, and a touch of dark Munich malt. We'd mash at a low temperature (150 F) for longer than usual (75min instead of 60) to promote more thorough attenuation by the yeast (higher ABV, less residual sweetness--usually a good move on a beer this big). The huge malt character would be countered with some serious hops (83 IBU of citrus/pine/fruity American hop goodness), which would mellow over the planned 10 month aging period. On brew day, our new mash tun performed beautifully (OK, it may have clogged a bit and taken a full hour to finish emptying, but still), and we ended up with a full 8 gallons into the kettle, which boiled down over 90 minutes with significant vigor (and splashing at times) to about 6 gallons. Of course, a momentous 50th brew day requires a truly special beverage--luckily we had picked up just the thing at Beer Run earlier. Sierra Nevada's Bigfoot Barleywine--vintage 2011! Three years of aging had turned this big, hoppy bruiser into a sublimely smooth malty delight. And, as an added bonus, drinking the same style of beer you're brewing is especially pleasing to the beer gods. After 3 weeks of fermentation and conditioning, we split the batch and sent half to a keg, the other half into long-term aging. We'll pour the kegged beer in a few weeks, and the other portion next winter, when it will have taken on some very different characteristics. Mash at 150 F for 75 minutes, boil 90 minutes. Ferment with US-05 or equivalent (62 F ambient temperature for 1 week, 65-75 for 3 weeks, then age or serve. Hi everyone! Long time no updates, I know, but there's been a lot going on here at WrongSide. Back in November, Cameron found himself a job at Three Notch'd Brewing (@ThreeNotchdBeer) here in Charlottesville. He started out working the taproom, but after putting in some off-the-clock time in the brewhouse, is also moving into a quality control position. For now, this means cleaning all the draft lines serving Three Notch'd beer around Charlottesville (and, as of this weekend, Harrisonburg/Waynesboro/Staunton!) and setting up a lab that will eventually handle yeast management and brewing chemistry. Three Notch'd has only been open since September, but is already making a big splash in central Virginia under the guidance of brewmaster Dave Warwick. We're all very excited about the future of Three Notch'd and Cameron's involvement in it. Look for a WrongSide/Three Notch'd collaboration brew sometime this spring! Sean has been working on some data analysis of recipes in online homebrew databases. He's got some pretty cool visuals put together from the initial data, but lots more remains to be done. This analysis should give us some valuable information about patterns and trends in homebrew recipes all across the country. Stay tuned! But enough about us, you're here for the beer! Due to many weekend taproom shifts, brewing frequency is down a bit (but recovering). Since the last (embarrassingly old) blog update, we've brewed only a couple of beers: our Belgian dubbel, an amber ale, and a very special 50th batch (more on that shortly). In the pipeline we've got a couple of experimental brews, both in the style of traditional German lagers but brewed with ale yeast. We're doing an ale-style repeat of a maibock that turned out very nicely as a lager last year, and a blonde doppelbock-style ale. Both should deliver malty goodness and (hopefully) lager-like crispness through the use of Kolsch yeast and a cooler-than-normal fermentation. We've also got plans for a series of IPAs later this spring to explore all of the delicious hops we picked up after last year's harvest. And, of course, springtime means mead time for us, as our late-summer ingredient-gathering and meadmaking combine with extensive patience to yield delicious, well-aged effervescent honey goodness. This year's mead was a berry melomel (mead with honey and fruit), with blackberries and blueberries picked fresh locally (well, in Maryland just northwest of DC, but close enough). It weighs in around 14.5% and tastes like way, way less, ensuring that the second annual March Meadness party will be a rousing success. That's about all we've got going on right now, watch this space for a feature on our 50th batch and the fruits of Sean's number-crunching labors in the next few days. As we're sure you've all heard by now, we'll be participating in the Homebrew for Hunger event this coming Saturday, November 9, 5-8PM at Fifth Season Gardening. Homebrew for Hunger is an event that started in North Carolina and has now expanded northwards to our fair city. The event works like this: people buy tickets (get yours here) to enjoy beer tastings from local homebrewers and pro brewers (check out this year's lineup here), and proceeds from the ticket sales are donated to a local food bank (for the Charlottesville event, that's Blue Ridge Area Food Bank). Homebrewers get to show off their stuff, you all get to enjoy a variety of great local beers, and this charitable organization get some much-needed help. Everyone wins! For this weekend's festivities, we'll be showcasing two of our more seasonally-appropriate beers: our Cygnus X-1 Stout (to be added to our list of year-round offerings) and a Scottish Wee Heavy that we're calling Bogwater for now. Descriptions follow (we've also added these to "Our Brews" section). So please come on out this weekend to support your favorite local homebrewers and help out a good cause! A classic American stout. Big, bold, and jet-black (it is, after all, named for a well-studied black hole), this stout is brewed with standard American pale malt, some extra dark crystal malt, heaps of roasted barley and chocolate malt, and some flaked oats to give it an extra-creamy mouthfeel. Bursting with dark caramel, chocolate, and roast notes, this beer is fermented with British ale yeast to leave some hefty malt sweetness behind, balancing both some medium herbal/earthy hop bitterness and the sharper edges of the roasted malt flavor. A perfect beer to sip while you watch the leaves fall, or whenever the mood for a hearty stout strikes! 6.6% ABV, 46 IBU. Styled after a traditional Wee Heavy (the strongest of the Scottish ales), Bogwater puts malt flavors front and center. We use imported Scottish Golden Promise barley, dark crystal malt and a bit of smoked malt to round out the grain bill. In our own twist on the Scottish style, we've also added a bit of Muscovado brown sugar for some molasses flavor and to dry out the beer a bit (Wee Heavies can often end up quite thick and sticky). Huge notes of caramel, toffee, toasted bread, and other malty flavors dominate this sublime amber-brown brew, with just a hint of hoppiness to keep it from getting cloying. Fermented cool and clean with Scottish ale yeast, and conditioned for 2 months to help the complex flavors meld together. We think you'll really dig this beer. 10.6% ABV, 24 IBU. Way back in April, we got together with our friend Wes Harris and put on a little event, involving the consumption of a beer (our first Naked Mole Rat), some delicious pork bellies smoked with spent grain from said beer (Wes's meat-smoking genius in action), and side dishes brought by various and sundry friends. It was a huge success, and the porter got some pretty rave reviews. After a few months of pestering, we've brewed it up again. A slightly different, hopefully even better evolution of the original recipe. Brewday was Sunday, when Carly (@TwoSpoonsPhoto) was hanging with us and taking pictures, hence the dramatic uptick in photo quality. This particular beer starts with a basic American Porter base. Standard 2-row brewer's malt, roasted barley and chocolate malt for rich roastiness, dark caramel malts for a bit of sweetness and body, and a little black malt for just a hint of burnt flavor. Cluster hops for a bit of floral/spice character. Neutral American ale yeast, finishing around 6-6.5% ABV. The real heart of this recipe, of course, is the spice blend. We use chocolate, cinnamon, and (most important) three kinds of peppers to approximate a real mole blend (which usually has upwards of 15 ingredients and takes hours to make). Chocolate comes from cacao nibs, peppers from our garden, and cinnamon from a jar (we don't know how to grow cinnamon). We've been growing the peppers in the backyard garden since March, and they've been putting out huge yield from July until roughly now (we're expecting to finally lose them in the first freeze this weekend). For the mole porter, we've used cayenne (fresh), jalapeño (cherrywood smoked), and ancho (cherrywood smoked) peppers. Fresh peppers go in at the end of the boil, smoked peppers, chocolate, and cinnamon soak in grain alcohol for a week or so to sanitize and extract flavor, then get added to the fermenter. We'll ferment this beer for about three weeks (including time to condition with the spices added), keg it, and it should be making an appearance sometime in mid November. Cheers! We'd like to send out a huge thanks to our friend Carly Romeo of Two Spoons Photography for coming out to Charlottesville today to do a photo shoot for us. Carly has long been a supporter of WrongSide. We served three of our beers for her wedding/love party last year and we received an incredible response from all of her guests. Our kegs emptied fast and every one had a wonderful time. As we mentioned in our last post, we answered the call again to serve beer at Carly's art opening earlier this month at Gallery5 in Richmond, where we served our House Pale Ale. It wasn't the only drink option available to her guests, but it was the first to run out. Once again, thanks Carly! We can't wait to collaborate with you again! Here at WrongSide, we've been spending some time developing a stable of tried-and-true "house" recipes--staple beers that we can brew consistently time and time again. The first in this series is our House Pale Ale. The first version was brewed over the summer, and version 2 just a couple of weeks ago. The first iteration was good, but a little too malty and it lacked some of the citrusy hop punch that typifies the American Pale Ale style. So we went back to the drawing board and tweaked the recipe, simplifying the malt bill (from 3 base malts and crystal malt down to just 1 base malt and crystal) and switching out the Meridian hops (lovely fruity flavor, but not very aggressive) for Cascade (the prototypical citrusy American hop, most familiar to beer drinkers from Sierra Nevada Pale Ale). Come mid-September, it was time to brew. We use the brew-in-a-bag (BIAB) method for our all-grain beers. This enables us to brew all-grain without an equipment-heavy (and time-intensive) three-vessel system. Traditionally,brewers combine hot water from a tank and crushed grain malts in an insulated container, or mash tun, for the mash (process that extracts sugars from the grains), then drain from that container into the boil kettle. BIAB uses the boil kettle as the mash tun, by means of lining it with a fine mesh bag. Once the mash is complete, the bag (containing the grains) can just be lifted out of the kettle and then the boil can start. You can see the edges of the bag around the top of the kettle in the image below (the grain and water mixture is in the bag, hidden by a layer of foam). For this beer, we mashed at a temperature of 153 F, which yields a medium-light bodied final beer. 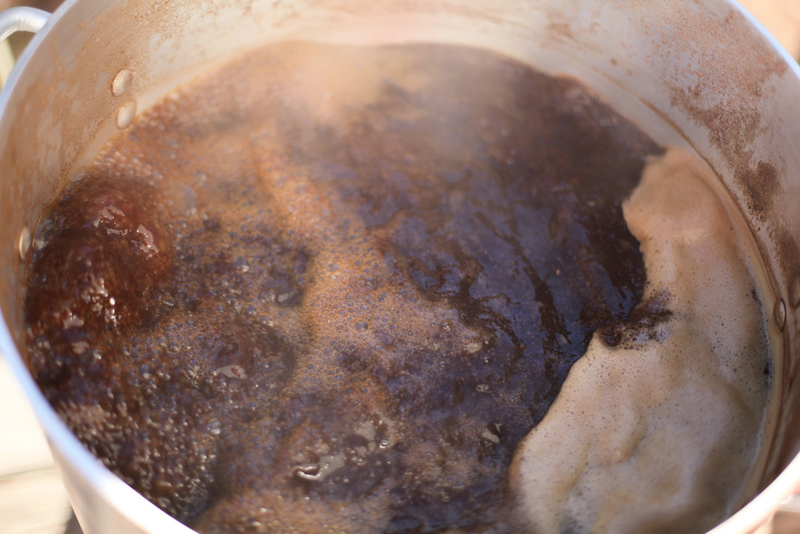 Mashing at higher temperatures creates more complex sugars (which tend to stick around after fermentation, lending a thicker body to the finished beer). Lower temperatures create more simple sugars, which get almost entirely converted to alcohol and lighten the body. After the mash is over and the spent grains removed, we fire up the kettle for a 60 minute rolling boil, during which hops are added at various times. Boiling hops longer creates more bitterness, while adding them closer to the end of the boil preserves more flavor and aroma compounds (these volatile compounds tend to get driven off during a boil, so "late additions" are used to ensure a beer with lots of hoppy goodness). 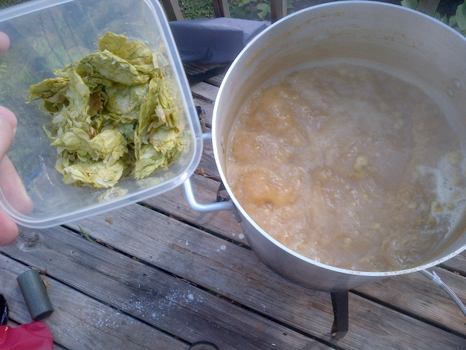 Below you can see one of our late additions of Centennial and Cascade hops, about 15 minutes from the end of the boil. Of course, you can't make beer without drinking beer (it angers the gods), so I poured myself a pint of our homebrewed IPA during the boil. Once the boil is over, we use an immersion chiller (copper coil that sits in the hot liquid while we run cool water through it) to cool the wort (beer before the addition of yeast) from 212 F down to a temperature that's more hospitable for yeast. In the winter, we can generally get the wort down under 75 with just tap water, but in the summertime the best we can do is about 85. Since yeast will throw all sort of undesirable flavors if pitched at too high a temperature, we let the wort sit in the fermentation bucket in our temperature-controlled chamber (read: converted minifridge) for a few hours until it gets into the mid-60s. Then we add yeast, seal it up, and wait patiently for the yeast to do their thing. Once fermentation is completed (generally 7-10 days later, with special considerations for particularly high-alcohol beers), we perform a brief cold crash (chill the beer to near freezing for a day or so) to help settle out yeast and other hazy particulates, then transfer to a keg. After a few days under CO2 pressure, the beer is ready to rock. 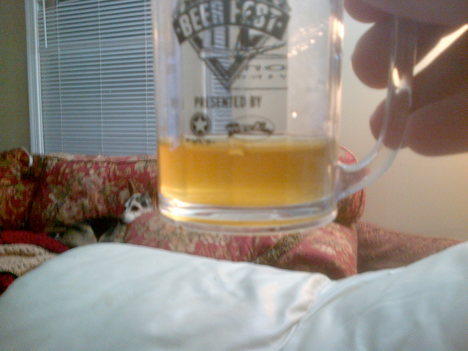 You can see a sample of the finished pale ale below (that's Gracie, our brew dog, in the background). This particular batch went off to Richmond to be served at the opening of a friend's photography exhibition at Gallery5. The 5 gallon batch was drained in short order, and reviews were good, so we were quite pleased. Our changes to the first version of the recipe had the desired effect--the malt was de-emphasized and the hop character substantially more prominent. This recipe may get tweaked a bit more before the next version, but we're pretty pleased with where it's at now. Brew it up and let us know what you think!